The Alphabet Challenge Revisited is back! Sorry about the delay, Gambrinus has suddenly decided to play hard to get - but don't worry no beer could ever hide from me forever! I managed to finally find one of Christmas Eve - a Christmas miracle if you will. Last time I said: "Gambrinus is a nice Czech lager. It looks and smells just like you would want any beer to, a nice golden colour and slight floral aromas. The taste is quite sweet for a lager, but is still very good. Like a lot of Czech beers this is definitely one that you will either love or hate, definitely worth a try!" We can certainly improve on that! 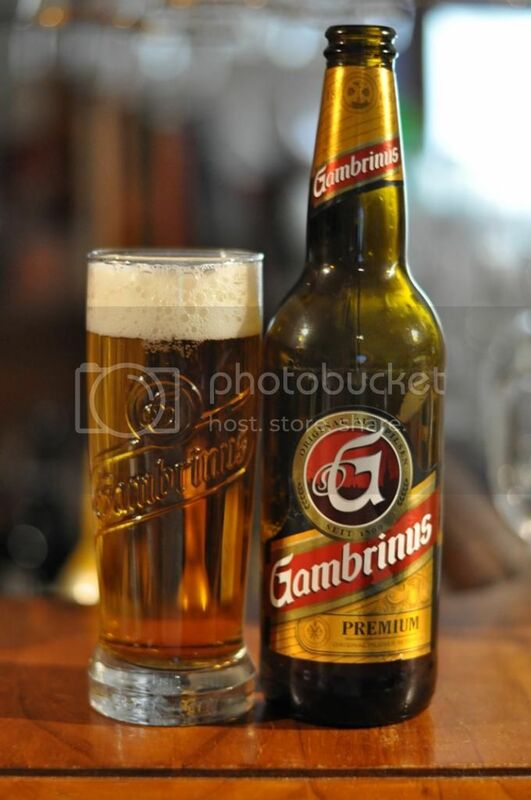 Gambrinus pours a deep golden colour with a white head. The head retention is a little lacking, I'm not sure if that's a batch issue or something to do with this thinner glass, normally it is excellent. There is plenty of small carbonation bubbles rising to the head, yet by the end of drinking there is no evidence a head was ever there. It's a shame as the body of the beer is such a beautiful colour! The nose is quite nice, albeit light, for the style with plenty of grass and spiciness from the Saaz hops to the fore. There appears to be a nice caramel malt base which becomes stronger as the beer warms. As I said earlier though it's quite light with all of the aromas mentioned above in moderation - don't expect massive bitterness on the nose, it's a Pilsner! I'm very pleased to report that this bottle of (a slightly different) Gambrinus has travelled better than the previous one reviewed on this blog. The beer had the Saaz bite that I like to see in proper Czech Pilsner's with plenty of grass and spiciness. The malt base is there to provide body but imparts very little, if any, sweetness while still being quite flavoursome. It's a lager with a bit more substance than most and one that I greatly enjoy. Gambrinus is now brewed by Plzensky Prazdroj in Plzen, the same brewery who brewed the first Pilsner (Pilsner Urquell) in 1842. Subsequently it's no surprise to find out it's a very good example of the style. This is a beer that I always recommend to lager connoisseurs, it's got a bigger all round flavour than many of the other Czech Pilsner's and is one that I always like to hear people's opinions about. Try Pilsner Urquell and Gambrinus together and it will really emphasize the differences. Hopefully this has summed up Gambrinus a bit better than I had previously - I promise it won't be another 7 and a half months before there's another Alphabet Challenge review - next up Halida.